Buffalo Sauce is one of the easiest condiments to make at home. Butter, hot sauce and garlic are all you need for a quick, delicious homemade buffalo sauce. I have a serious love of anything and everything “buffalo” flavored. Last winter my mom and I decided to break out the deep fryer make our own buffalo wings. 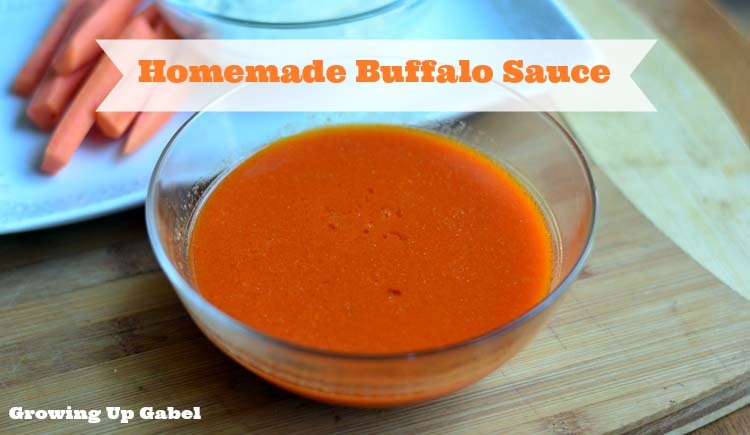 We needed a buffalo sauce that wasn't too spicy because we have some serious wimps in the family so I set out to create a basic buffalo sauce we could use as a base. The fun thing is that you can make the sauce as spicy – or not – as you want. What I love most about this sauce, other than the flavor, is that it takes about 5 minutes total to make. You can whip it up at a moments notice. 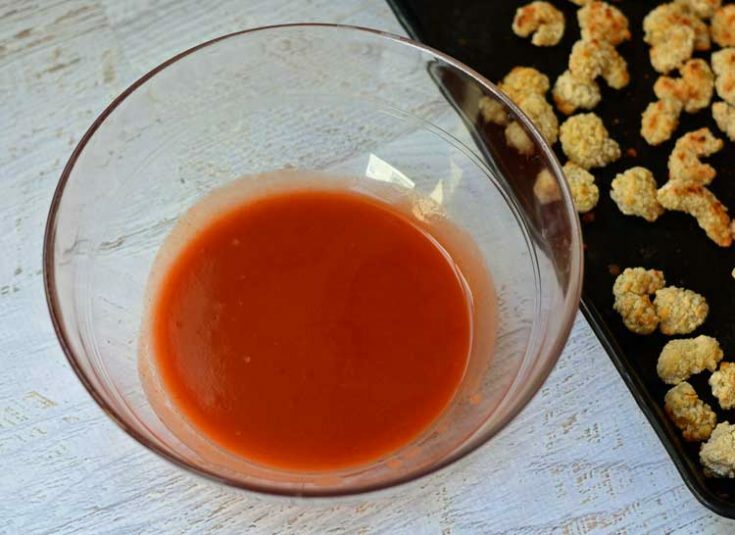 The recipe is a great base to create your own unique buffalo sauce! I would say this is a mild buffalo sauce. If you want it spicier, I'd add a little Tabasco or more Frank's to it, a little at a time until you get the right amount of heat. More garlic? No problem – just add it in! A little honey to sweeten it or ginger to add an Asian twist. 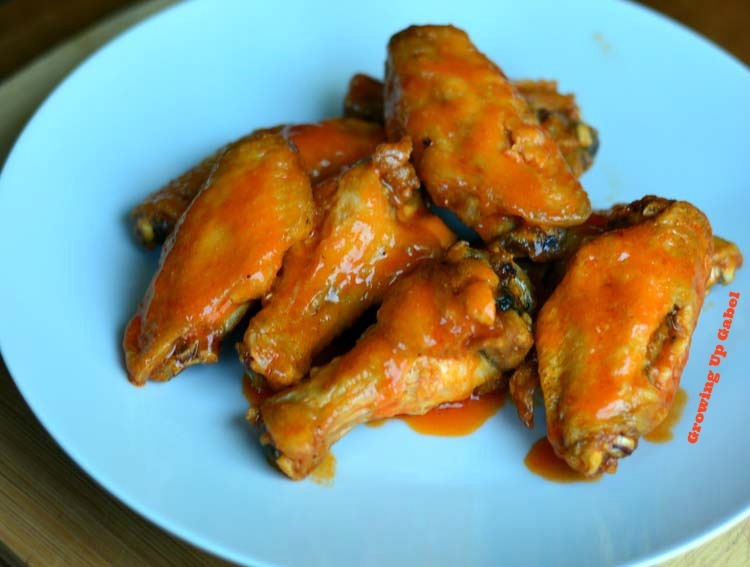 Other than the obvious use on chicken wings, I love to use homemade buffalo sauce on a buffalo shrimp salad, in buffalo popcorn and even in the slow cooker for buffalo chicken sliders! The possibilities are endless. Melt butter in a small sauce pan over low heat. Once melted, remove from heat. Add rest of ingredients and whisk to combine. If I don’t have white vinegar can I use malt vinegar? It will give it a different flavor. But you can try it. delicious sauce, I cooled it down just a bit by adding just little tomato sauce. Or the Butter, White Vinegar and Garlic Powder, are you really that far out!? Franks Cayenne Sauce is easy to make though, like Tabasco, simple ingredients, simple formula, it’s not rocket science! great recipe! I love it! I made it with pulled chicken for sandwiches. Still one of my favorites! Glad you enjoyed it! Thanks for sharing this recipe. I made your sauce tonight to use in buffalo chicken calzones for dinner-YUM! That sounds delicious!! And you’re so welcome. I love this idea! When my brother was here visiting I bought him “wing sauce” because he uses it on a lot of food – I could have made him this!! Thanks for linking up with us on Throwback Thursday – we appreciate it, and are always looking forward to next week’s posts, too!! 🙂 I’ll be pinning to our board, too, so be sure to follow us there. This sounds super easy to make and super yummy. I’ve been trying to find ways to make more things homemade! Thanks for the share! I’m always trying to find a reason to make it and add it to something! My husband thinks I’m nuts…. This is fantastic! I was just wondering yesterday what was in “buffalo sauce” as I made buffalo chicken sliders. Thank you! Pinning. And, thank you for linking up at Snickerdoodle Sunday! I hope to see you again tomorrow!! Super easy, right?! Someone’s making a lot of money on that stuff! 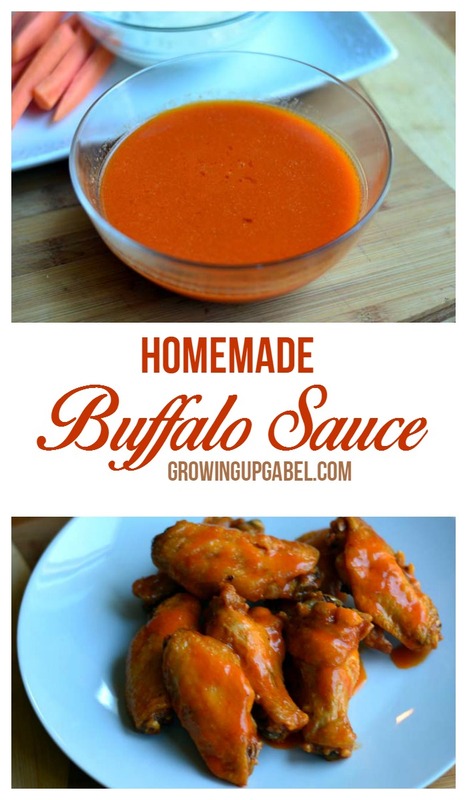 I had no idea buffalo sauce was so easy to make! I’m definitely going to try this with some grass-fed butter! I know! And you can add to it, too – or use grass-fed butter! Sounds really good….thanks for sharing with the Thursday Blog Hop! Yum! I love buffalo sauce! I add it to my hamburgers, grilled chicken, even roasted cauliflower. Thanks for helping me out with this recipe! Cauliflower!! Good idea! I’ll have to try that. It’s super easy to whip up! I just love your sauce and will sure be trying it very soon. Hope you have a great weekend and thank you so much for sharing with Full Plate Thursday. Yummy, my son loves buffalo sauce on his chicken wings, tenders, etc. This will come in handy. Stopping over from WFMW. It’s always nice to have a back up! Thanks for stopping by. Hi Todd,I bought the Grouper when it came out — it was LP only and ridiculously limited, unrotfunately. I’d keep checking the MP3 blogs, though. I was able to find MP3s for the album shortly after it came out on one of those.Brian B. We make our own buffalo sauce too and make it the same way except we don’t add vinegar. Now I need to try it with the vinegar because that sounds like a yummy addition! So nice to see how easy it is to make Buffalo sauce. Now I know why I like it so much. Hot sauce + butter + garlic = yummy! So easy! And I love Frank’s Red Hot! Thanks for sharing! My stepbrother does this all the time when we have “plain” chicken for dinner. I’m amazed the butter doesn’t show on his frame! This is a great recipe, love the idea of making it! Now, if I could just know how to substitute that famous Frank´s sauce..
Firecracker Chicken ~ Spice It Up #SundaySupper!